Chocolate caramel cookie bars are made in a bread loaf pan for a small batch of your favorite candy bar! 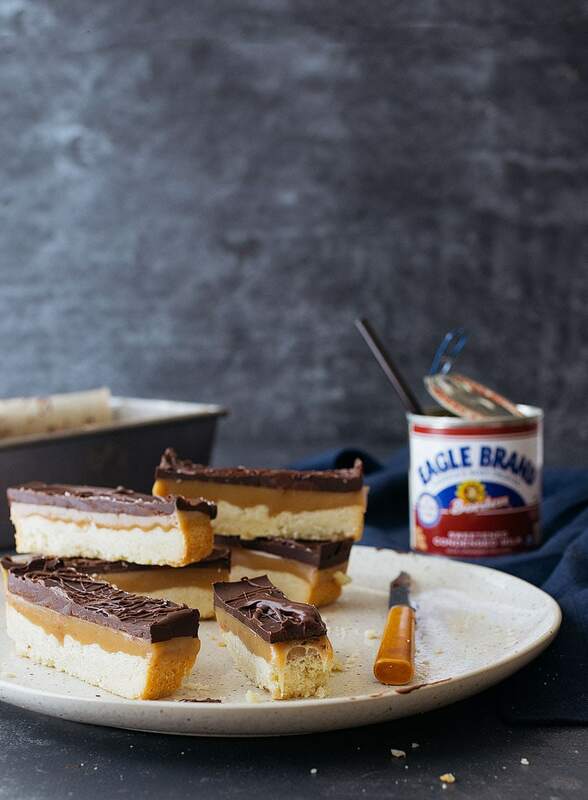 Also, this post is sponsored by Eagle brand sweetened condensed milk, a product that is always in my pantry for baking, and a product I’m proud to feature. All opinions, text, recipe, and photos are my own. Hooray for baking season! Oh, does that phrase make you nervous? Are you instantly transported back to memories of last year’s cookie exchange when you had no idea what to bake and spent many stressful hours in the kitchen desperately trying to make a treat worthy enough to impress your friends and family? Stop it. Just stop it right there. I mean it! Today, I’m sharing the concept of an Uncookie Exchange. An Uncookie Exchange is when you get together with your friends and bring anything except a cookie! I love this idea because bars are easier and faster to pull together than cookies. I want to talk about each layer of these caramel cookie bars. The bottom layer is one big cookie. It’s even easier to make than individual cookies because it only has 3 ingredients, and instead of scooping out dough, you just dump and press it into your pan. Next layer, please! We’re making homemade caramel. I know it sounds intimidating, but it’s totally not when you make it with sweetened condensed milk. Think of it as an easy shortcut to caramel because sweetened condensed milk is just milk from which the water has been removed and sugar has been added. And since caramel needs cream and sugar, it’s a great shortcut! Plus, a can of sweetened condensed milk can hang out in your pantry until you’re ready—no last-minute trips to the store for heavy cream! Just boil the sweetened condensed milk with brown sugar, butter and a squeeze of honey for 5 minutes while stirring. You can do it! You can be amazed with yourself with each passing minute that you are in fact making homemade caramel. When it’s done, stir in a touch of vanilla and salt for flavor. This caramel will set up the perfect consistency: chewy, soft and stretchy, just like the caramel in candy bars! You are such a rockstar. Finally, the melted chocolate goes on top. Truthfully, melting chocolate can be tricky. I actually think it’s harder than making homemade caramel sauce, but we’re going to take it nice and slow. 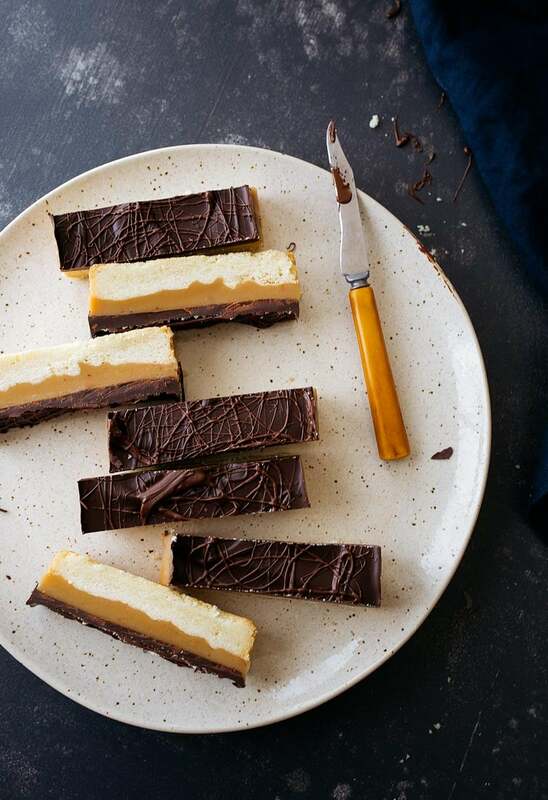 Your chocolate caramel cookie bars are waiting for you in the fridge, so no need to rush. Just combine your chocolate with a splash of leftover condensed milk from the can, and melt it slowly in the microwave. Stir between each 20-second microwave pulse, and stop before it’s fully melted. When it’s drippy, pour it over your bars and let set. You’re done! You made it! 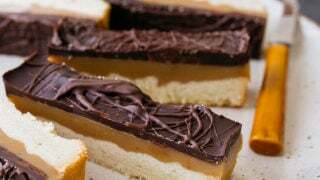 Small batch homemade Twix bars or millionaire shortbread bars! Line a 9x3x5” bread loaf pan with parchment paper in one direction (the 3” ends can be exposed). Slice the softened butter into 7 pieces, and add it to a small bowl. Add the powdered sugar, four and salt, and work it together using a large fork, a pastry blender or two knives. When the mixture is evenly combined, it will look like sandy sugar cookie dough. Press it into the prepared loaf pan. Press it as flat as possible. Bake for 25 minutes, until golden brown and very fragrant. Don’t be afraid of a little color around the edges. In a small saucepan, make the caramel: combine the butter, brown sugar, Eagle Brand Sweetened Condensed Milk, honey and salt. Bring this mixture to a boil while continually stirring. Let boil while stirring for a full 5 minutes. Remove the mixture from heat, and stir for another few minutes—it will thicken. After about 3 minutes of stirring, add the vanilla and stir to blend. Pour this mixture over the cookie crust and place the pan in the fridge to set. Let the caramel completely set before adding the chocolate top. To melt the chocolate, combine it with the Eagle Brand Sweetened Condensed Milk in a small microwave-safe bowl. Microwave on 50% power on 20 second intervals, stirring after each pulse. After about a minute, the mixture should almost be melted—remove it from the microwave before it melts completely and stir until smooth. Pour the mixture over the chilled caramel layer, and spread until smooth. If you want the swirly top, hold back some chocolate and drizzle it on top after about 5 minutes. Place the whole pan back in the fridge and chill until set, about 2 hours. What do you do with the leftover sweetened condensed milk? Great question, Sonja! I usually stir it into my coffee or tea in the mornings. However, I’m working on another recipe to use up the rest of the can. Stay tuned! In the meantime, this recipe is a great way to use it up, too! There’s a link on the word recipe, sorry if that’s confusing! 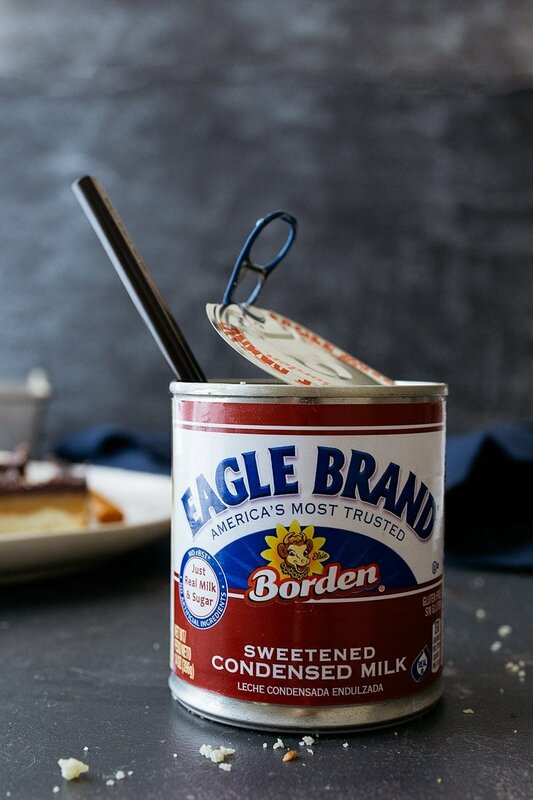 Have you seen the Eagle Brand Chocolate Sweetened Condensed Milk? I ran across it at my grocery store recently but didn’t buy it. I have to wonder how the caramel would turn out if you used that instead of regular, might have to pick one up on my next trip. Anyway, can’t wait to make these bars. Homemade Twix, yum! Can this be doubled and put into a larger pan (9×13?) I bake for lots of people at a time and would love to try this on a larger scale. So, this is for a bread loaf pan measuring 9×5. It’s more similar to 3 or 4 times smaller than a 9×13 pan. If you want to double it, make it in a 8×8 pan. If you want a 9×13 pan, quadruple it. But here’s the thing: I only test my recipes as you see them written. I make small batch recipes. I don’t scale down a recipe and perfect it, and then turn around and scale it back up. So, I can only speak to results from recipes followed as-written. If you make it and quadruple it, I’d love to hear how it goes. Oh man, just when I thought I dodged the sugar hangover on Halloween…definitely will be making these! Hi.. thank you for an awesome recipe. Could U please tell me the shelf life of these bars? Thank you! I’d say 3 days in the fridge, if they last that long! I am so in love with caramel bars. These look delicious. I’m definitely going to try this recipe. The problem with caramel bars is that they go so quickly. Everyone in my family loves them. Making these now and can’t wait to try them, but I had a terrible time with the chocolate. Seized up, so I tried a double boiler, seized up again and I had to add cream to loosen it up. I don’t think they will set form now, but they’ll still taste good! Could it be because I used semisweet and not milk chocolate chips? Aww man, chocolate is a BEAST in the kitchen. It takes so many tries to learn how to properly melt it without scorching. It’s very temperamental, unfortunately. The safest thing is a double boiler, like you used. As for semisweet vs milk…I mean, the milk chocolate chips have a touch more fat/cream to them, but honestly, I don’t think that’s it. Try adding more cream or sweetened condensed milk from the beginning and melt very slowly. Best of luck next time! Hello! I was just wondering if the caramel has to be poured onto the cookie crust immediately after it is ready? I waited for a while after making the caramel but I realised it set really quickly and could not be poured out. Thank you! Yep, should be poured immediately. It sets into a thick, chewy caramel quickly. I tried this recipe three times today, exactly as written- the first time, the caramel was way too hard. So I made it again, boiling it for a minute less. Rock hard again. Third time boiled for just three minutes- still too hard to eat. Not sure I want to try it again, but wonder why it want soft and chewy. I always love your recipes so I was disappointed. I tried to make these on Friday and nothing was working so I quit. First batch of caramel ended up with a really weird consistency. Second batch ended up being so hard after it set that I couldn’t even cut it (and i let it boil for 4 minutes since it was already getting dark). Let’s not even start talking about the chocolate layer. I bought more ingredients today and I’m going to try again. I really want these to work for me. Oh no, Stephanie! Can you elaborate on weird consistency? Did you make any changes to the recipe? Did it actively boil? For the second batch, if it was hard, it was over-cooked and too much moisture evaporated. Honestly, melting chocolate to the proper temperature is a tricky thing. It’s more of a skill that takes time to develop. The more you melt chocolate, the better you will be! These are so much more satisfying than any Twix I’ve ever had. And that’s saying something, cause I love those things. I tried to melt the chocolate your way, I really did, but it seized up into a useless blob. So I melted another cup of chocolate chips the way I usually do- just nuke them in the microwave in 20 second intervals until they’re smooth – and the result was shiny and perfect. These are yummy little bars. I’m going to feed them to my knitting group tomorrow and I know they’ll be impressed. After rereading my comment here I realized it doesn’t make sense. The point is to not include the condensed milk when melting the chocolate chips. They melt just fine on their own. Nuking chocolate is the only way it works for me. My daughter told me she even puts the chips into a plastic piping bag & nukes it so I tried and made lacy 4″ inches taller than the pink frosted 2 layer cake, dark chocolate designs on wax paper and as it was almost hard I added it around the cake. It was so easy yet a huge hit & everyone loved it! The birthday lady cried. Anyway, you could make some to stick on top of these cute cakes for a party desert! Thanks for the recipes! these look SO much better than that candy! How long and how may these be stored? If you add more sugar to already sweetened condensed milk surely it would make this whole thing just way too sweet. 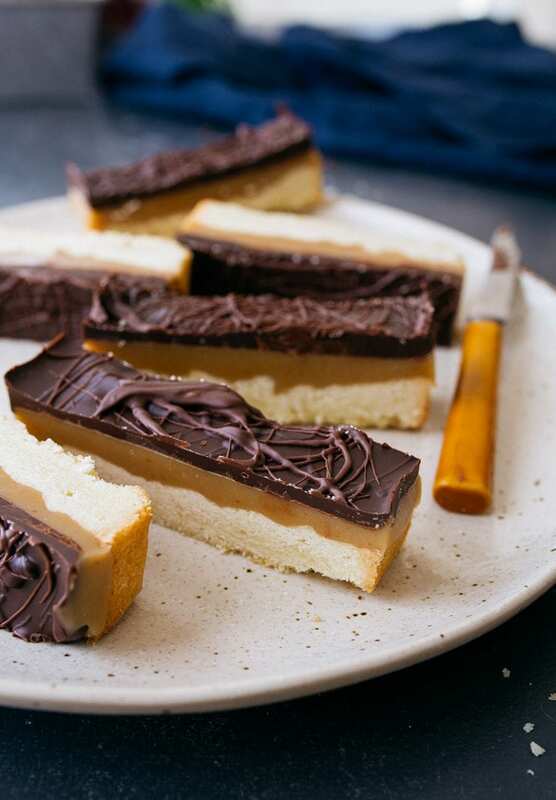 Also these are millionaires shortbread not really twix (although l can see why you might call them twix). Just reading this recipe hurts my teeth! Will give it a miss! You should really try things before you criticize them. I make caramels often. I’ve learned the hard way : almost impossible to get right consistency if it’s raining/very high humidity & if I’m tired/impatient & bring boil up too fast/heat is too high. Hopefully this helps! These came out super tasty, but I didn’t think to measure my loaf pan and I think it must be on the small size because mine are so thick I can’t bite them top to bottom. Haha. Oh well, they’re still delicious, I think next time I’ll try making them in a muffin tin. Thanks for the great recipe! I made a double recipe of these and they were delicious (a serious sugar hit though!). I had the same problem of chocolate seizing up that others have been mentioning – after two failed attempts, I realized it was the sweetened condensed milk! I didn’t use Eagle brand, so maybe that was the problem. Anyway, if you’re having the chocolate-seizing problem, I recommend trying the melting without the sweetened condensed milk. Had to try these! My MIL always insisted that Twix were not a candy bar but a cookie so that gave her freedom to eat more than one at a time somehow! Because of the comments, I tried melting the chocolate and Eagle brand sweetened condensed milk in the double boiler…didn’t work, just a dried glob. Interesting that you didn’t have that trouble. Other than that these were great and so nice not to have 45 temptations staring at me…only 9!! I made a hard copy to add to my dessert book. Thank you! I just made this and YUM! However, I opted to make a Peanut Butter caramel recipe I found (I am afraid of making caramel without knowing the temperature it should be cooked to, while I was searching for something like yours with a temperature, I found one for PB, the hubby’s favorite!). Also, instead of melting the chocolate, I just sprinkled it on top of the hot caramel, let it melt and then spread it. One less dish to clean and no possibility of seizing. Thanks for all you do, love your recipes. I made these for my Super Bowl party yesterday and they were a hit! I too had an issue with the chocolate but I realized that I used semi sweet chips first so I got some milk chocolate chips and the microwave melting method worked perfectly. My caramel came out perfect the first time. These are sweet and delicious! Are the calories listed, right? 2862 calories seems awful for one serving. No, it’s for the whole pan. Sorry!